Recognizing the paramount importance of nanotechnology to the future of mankind, the same enthusiasm and dedication is channeled to Nanoscience and Nanotechnology R&D. 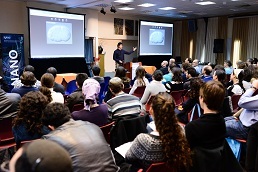 Vigorous recruitment of bright new faculty from research labs around the world, extensive investment in infrastructure, new educational programs for training the next generation of scientists and engineers, and nurturing of multidisciplinary collaborations within campus, as well as with industry and other academic institutions, provide the vehicle for achieving the desired impact on Technion, the State of Israel, and the well-being of mankind. Over 150 faculty members and 300 graduate students and post-doctorate fellows from 14 different faculties, are already trailblazing nanoscale science and technology in Nanoelectronics, Nanooptics, Nanomaterials & Nanoparticles, Nanomechanics and their interface with Nanobiotechnology & Nanomedicine. Members come from a variety of faculties, including: Electrical Engineering, Materials Engineering, Mechanical Engineering, Chemical Engineering, Biomedical Engineering, Aerospace engineering, Biotechnology and Food Engineering, Biology, Medicine, Chemistry, Physics, Mathematics, Computer Science, Civil & Environmental Engineering.